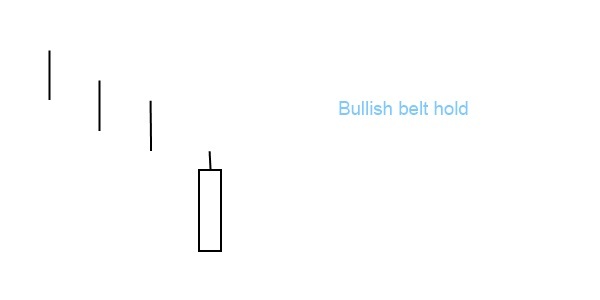 Bullish belt hold is a single candlestick pattern, mostly a white opening marubozu that forms in a downtrend. The market gaps down and opens at its low, and closes near to the high of the day. There is just a small upper shadow. Occurring after a downtrend, this pattern isn’t difficult to spot and it’s also quite common. But just like with all one-line patterns, it is advisable waiting a few candles for a confirmation. The longer the candle, the more powerful the signal. The pattern should be followed by a bullish candlestick as a confirmation. There is also a bearish belt hold pattern that is the opposite of the bullish belt hold. It is a single black candle that forms after an uptrend, but it predicts a potential reversal too.